It’s been a while since I’ve done a proper update post, so here are the most recent comic-related news bits I’ve got! I’ve slowly been working through the articles on Chiopedia to include stuff from the most recent chapters. If there’s anything in particular you’d like to see added, let me know! A few characters from Messenger are also making some special appearances to try and do some good in the world! As mentioned previously, Eldora and Finnegan are making an appearance in a charity cookbook (due for release in February 2011), and Aki is also making an appearance in a special downloadable wallpaper produced by the Comic Creators’ Alliance to help stop human trafficking! This wallpaper will be available by donating the amount of your choice through the CCA website starting on January 11 (coincidentally, my birthday!) through the 24th. Find out more by visiting the Comic Creators’ Alliance! 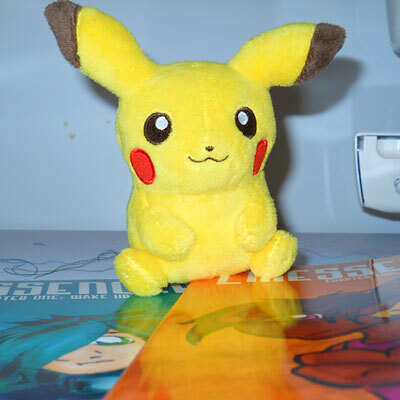 What has Pikachu found? Looks like the print edition of book 2 has arrived! Click on through to see some pictures of the gorgeous full-color print and find out more. 2010 has been an amazing year for Messenger. In total, 80 new pages were added to the online archive, which doesn’t include the 30 or so revision pages I did for Chapter Two and the minicomic extras for the second book. Regardless, it’s substantially more than an ordinary year’s worth of pages due to the fact that I started doing twice weekly updates in the fall. 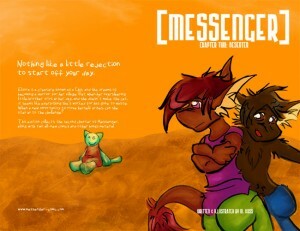 Messenger also hit the printer twice, with a re-issue of book 1 and the entirely new release of book 2. Webcomics are usually a one-man show, and Messenger is no exception, so I’m pretty pleased to have successfully kept up with regular updates as well as produce two whole books of approximately 100 pages each. This year felt like a huge advancement in the things I’ve learned about making comics; from writing and art, all the way down to promotion and running advertising on the site. 2010 has been the first time I’ve truly had a chance to sit down and work through an entire chapter of the comic at once instead of working on it when I can, and I feel that the quality of it has improved overall as a result. This is kind of a bittersweet thing, since I’ve spent most of the year aggressively job-hunting – but I’ve also learned a lot about advertising, and have managed to make enough of a profit via advertising to pay (at least) for groceries in addition to the upkeep of comic-making supplies. I may be a broke artist, but at least I’m not starving! While I know that I’ll never be able to turn this comic into a full-time job, it’s an exciting and satisfying feeling to know that I’ve been able to do as much as I have just in the span of this past year and it feels worthwhile to have spent all this (unfortunate) free time I’ve had working on it. All things considered, 2010 was fantastic. For once I really feel like I’ve made massive steps from where I started when I first put the comic online in 2004. If all goes according to plan, 2011 will be even better. My next steps include starting work on book 3 as soon as possible, getting through the rest of Part 1 of the main comic, and possibly doing some side stories from the Messenger universe. Book 2 is now available from Indyplanet! This issue is completely Chio-centric, featuring all of Chapter Two plus two print-exclusive minicomics telling the story of Eldora and Icy, as well as the creation story the Chios tell their children. There’s also a bonus article on the origin, physiology, and culture of the Chios. I haven’t received my copy in the mail yet, but the proofs looked fantastic so I’m sure it’ll look great. Here is a link to it on Indyplanet, although the cover image seems to be broken at the moment. So, here’s what the cover will look like! It’s 94 pages and printed in full color. Like always, there’s extra information and clues to the overall story of the comic in the book that won’t be told in the main story for some time to come – so it’s a bonus if you do pick up the book, but you aren’t really losing out if you don’t. Last of all, I’ve also somehow found the time to assemble vote incentive images for the next month. That means there will be a new incentive every Monday until 2011! There’s a brand-new one up right now, and if you’ve got a spare second or two, you should also Vote for Hive! That’s all for now! Check back Friday for the last page of Chapter Nine!